Riedel, RTS, Clear-Com & Telex Intercom adapters & application notes for download & viewing. Often the wireless intercom antenna coverage is limited by the wall and obstructions in a venue. The belt packs just do not have enough coverage. This is how I do it. The first release of actual software to program Clear-Com's HelixNet digital comm system is oute some screen shots. Here is the history of a terrific intercom company written by two of the pioneers in our business, Stan Hubler & Doug Leighton. Must reading for those in the industry. Please visit Stan Hubler's website for a lot of Intercom Information. This manual was written by some of the most influential and talented people in the intercom business. While supplied by Telex, it covers all forms of intercom systems in general theory with lots of good examples. The systems in the book are somewhat dated, referring to carbon mic headsets, no information about fiber systems, only rudimentary information on trunking and does not include any information about Riedel Communications, Artist or Performer systems. However, this is the textbook everyone should use to learn intercom system methods. Isolating the power and system grounds while translating the call signal in several local comm systems. Changing audio into 2 audio paths, going and coming is the trick. Here is a drawing explaining how a HYBRID circuit turns 2 wire intercom (one circuit with audio both coming and going) into 4-wire audio (two audio circuits one coming and one going). Sometimes when you have many remote RTS systems interfaced to the same PL channel, multiple hybrids will not work. Here is a way to do it without using any hybrids. This seminar by Bill Whitlock from Jensen Transformers is the definitive information about grounding, from AC to audio. Presented as an audio panel on how to begin to expand your small intercom system. This is a 6mb file - right click on the link to download it. This is a system for using the Brother QL-580 label printer to make labels from data in an Excel spreadsheet. Very Powerful. Each label lists a dozen categories to go in the label. Feel free to modify the design at will. It is slightly complicated because the FSII can have 2 software selectable 4-wire pin outs. for Riedel, Adam, Clear-Com, Telex and HME. Quick reference notes. Riedel AIO-108 pin out diagram. Telex Adam RJ-11 pin out diagram. Telex Adam audio I/O pin out diagram. This information is helpful if you are trying to build custom audio in outs for radios. HME DX200 to Riedel Artist Digital intercom connection diagram. Clear-com Matrix+3 RJ-45 audio wiring diagram. Clear-com Matrix YC-36 ADAPTER diagram. PL System . com This website is run by one of the best Comm engineers in the country, Andrew McHaddad. In addition to tons of theory, he has the best compilation of wiring pin outs available. 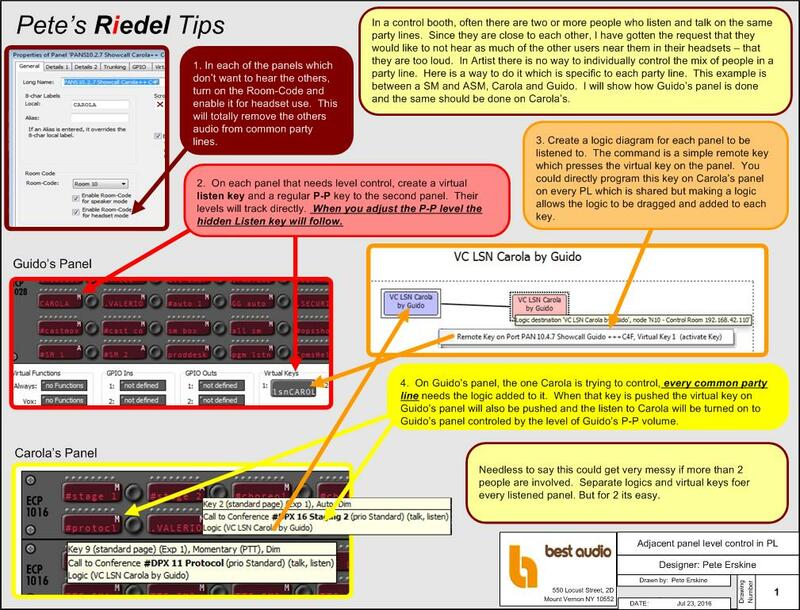 Riedel Artist Node full test program This is a test program for Artist 64 and 32 nodes. The arrangement of the nodes may not match what you have but cam be reconfigured by careful dragging and dropping to match your system. Change node type to a 128 and after you have it configured to your size chang the node type to yours. It also has a base config file as a starter to your show. Analog to Madi automatic switchover Our main interconnect is via madi leaving Our Artist as madi into a Mediornet node, fiber to the Broadcast compound and from the Mediornet node there, madi into the Artist system in the truck. As a backup we have 16 analog 4 wires interconnected to the Broadcast audio Multi in patch world. This logic and port design is to insure automatic switchover if any of the madi streams fail. Logic diagram copying. Often a logic diagram must be used in several places. Here is a way to copy it as suggested by Radauan Assadi, the head programmer on my summer 2016 job. Adjacent user level control - sometimes your neighbor voices are too loud in your headset when using the same channels. This allows you to mix your PL. This method is complicated but allows selection of only those PL which are common to the 2 of you - the P-P will still be private as will PL which are not shared. Adjacent user level control - sometimes your neighbor voices are too loud in your headset when using the same channels. This allows you to mix your PL. This is a slightly simpler way to do the listen but ALL talking of the other person will be heard even the P-P.
How to have many port clones - Panels can have only 1 clone button. Output ports can be only cloned once. Here is a way around those limitations. How to interface simplex radios- where you are using separate radios for RX and TX because they use different antenna systems. Sample artist file HERE. Simple way to interface a radio - Sometimes a request comes to transmit a comm channel over your radios. Short of renting a repeater, here is a simple way to do it with just your portable radios. 3 announcer headset mixer - using Studio Technologies Model 212 Announcer panel. When asked to provide specific feeds to each of three announcer's stereo headsets, I made a mixer out of an Artist panel. In a wireless 2 channel comm pack sometimes the user wants a little of a third Conference mixed into their pack just to listen. Determining what port needs its volume adjusted is sometimes hard to see in time. This makes the VC flash when audio is there. Here is a logic diagram which makes an automatic Flasher lite not so annoying. NEW: added a note about logic. This is the beginning of a series covering the whole process of Riedel Artist programming. This sheet serves as the outline but also is a simple 1 page checklist for programming a complete system. This explains what DynaConf is and how to create conferences from a panel. This function allows you the add ports to a conference from the panel. The new sidetone function is terrific. However there are situations where it doesn't quite work and this method is a manual sidetone program method I used in the days before the latest command was around. Here is more detailed information about setting up multiple NODES and using hermaphroditic connector multies. Before the IFB function was introduced, this was a way for MC Mic pre listen and IFB. The blank "64 button" Riedel panel - This is a step by step instruction on how to use this panel to key radios. As a comms operator, often you wish to monitor the audio on another user's panel. here are several ways. The ROUTE audio function cannot route to a Party line Conference. This is the way to do it and to monitor the line before connecting. As a programmer, I have evolved my setup for the station I use to make my job easier. Often I am listening to many different channels at the same time, listening for comm issues and setting comm levels. This is how I do it. A terrific way to cut down on the chatter on the camera channel and eliminate the massive 4-wire programming normally used while adding the flexibility to selectively let members of the group hear everything. Point to point keys are sometimes not very useful because the destination key listen has been turned off. Check the box in the call function of the button to force the destination listen to 0 dB. The destination will always hear your call. Key to this being successful is to have all users at a matched level out of their panels. Making a successful headset extension cable up to 10m. Headset Extension HERE is the datasheet of the Canare cable we have used for up to 30ft/10m and Charlie Butten’s big rule on how to wire them as well. In his book, if the cable doesn’t have 100dB of separations then it is no good for headset extension. Works like an IL19 does for Audio but for dual channel WET RTS intercom (or Clear-com) with audio only outputs. provides a isolated channel 2 for local communication for either RTS or Clear-com. Transformer isolation for BTR BuzzBuster using Best Audio PC board. Can also be adapted as a dual channel audio-only board by cutting a trace. Three way winding transformers make a more universal iso/audio only adapter. Connects TWO PS-31 power supplies to an RTS SAP612 dialup and provides 6 channels of powered comms. This is not a really complete solution. Using a 2-4 wire converter like a SSA324 from Telex or a CCI-22 from Clear-com, this adapter creates a wet version of the WTA private talk between 2 BTR systems. It's limitation is that only the second BTR has full connection to the WTA. Strips off the DC voltage from your intercom system WET lines and transformer balances the audio for recording or audio insertion. This adapter is NOT what you need to connect to a fiber system. See the HYBRID explanation above. Remotes the standard camera intercom to the rear of a jib and provides grip and Assistant Camera operators comm as well with paralleled beltpacks. If you have alot of 4-wire ports to balance this will help you do it without an assistant. Transformers which bridge intercom lines should have a relatively high impedance at low frequencies to avoid destroying the transmission line characteristics of wet intercom. Shorting the low end makes nulling hybrids on the line harder. This test found a good and inexpensive transformer. (unfortunately it is not made any more but the test reveals other possibilities). These are Telex official modifications to the BTR wireless intercom base stations. They rewire the AUX in such that it does NOT back feed the hardwire interface and can be selected to either just B channel or A+B channel. EVERY BTR OWNER SHOULD DO THESE MODS. This makes the aux in usable to send program just to the wired beltpacks. Additionally there is a +6 dB mod for the intercom out which partially corrects the defect in the design of the BTR 2-wire as tested on this website: BTR Test. This is a lab test using sine wave and pink noise to prove that the Telex BTR800/825 2 wire interface does not provide enough return level to the hard wire comm. FYI: The BTR system which was tested had the most current level increase mods as recommended by Telex. Intercom with disparate types of equipment need careful level adjustments. Here is a routine to do it. These Macros will work in any version of Excel thanks to help from Julian Gareis at Sprechlaut. Here is ONE FILE with all of them and here is how to put it in your Excel. Riedel Artist files can be edited in Excel and reloaded into Director. With the Help of Brad Harris this should work more universally. IAS frequency coordination software can be loaded into Excel. With the exception of Windows Explorer, and master sheet preview can be copied and pasted into Excel. This macro does some important formatting as well. IAS frequency coordination files can be loaded into Excel using this macro. Here's how to take you scan from a TTI and format the file for IAS, WWB and WSM import. Riedel Artist allows paste from Excel to the long names and 8char names and this makes it very easy for bulk name changes for large Artist files. TTI CSV Scan files have comments. IAS deals with them but workbench needs clean files. This shows a macro to clean your files. TTI CSV files need to have the comments removed to load into Shure Wireless workbench.